‘Turkey Mon Amour “Askim Türkiye”‘ is a special studio album featuring 12 musical masterpieces representative of Turkish heritage. Co-produced by Olivier Toussaint and Erkan Özerman, this album was released only in Turkey and proved hugely popular. 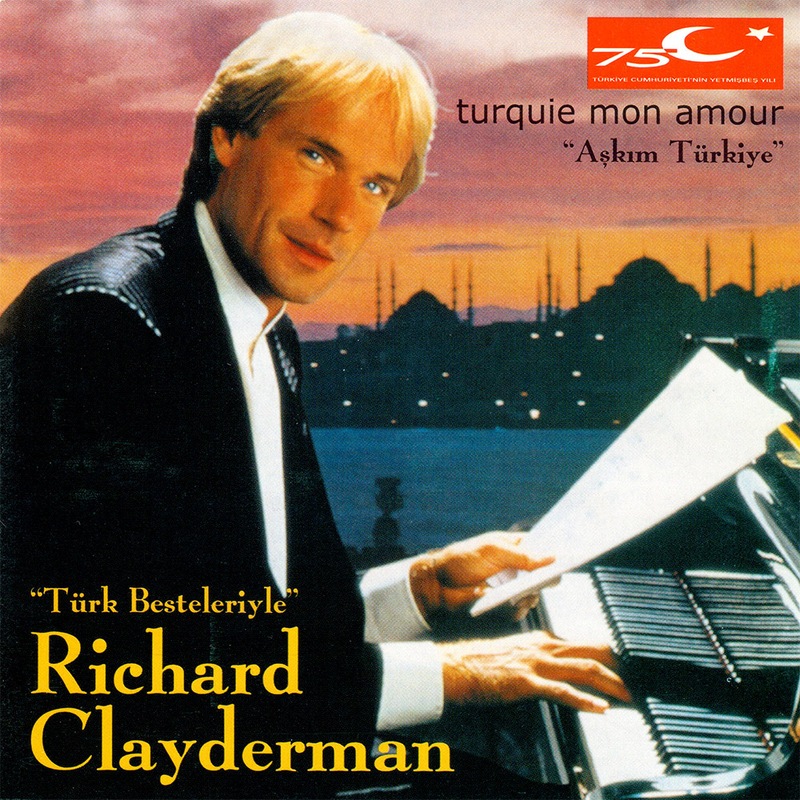 It has become one of Richard Clayderman’s most sought after recordings. The full album, or individual tracks can be downloaded from iTUNES. ‘Dedi Efendi’, ‘Seninle Bir Dakika’, ‘Yunus Emre’ and ‘Divane’. Erkan Özerman, a Turkish friend of mine, is the originator of this album, the instigator, the initiator. Now, please allow me to introduce him and let me tell you how and why I recorded this album featuring 12 Turkish titles. A powerful personality: Erkan Özerman is a voluble man with a great sense of humour. His perfect French, spoken with a certain Oriental accent, gives him an irresistible charm. He is also a music lover with a passion for the stage and the artists. He holds the positions of a “master” in the world of songs and stage in this country. We have met in the office of Olivier Toussaint, one of my two producers, about one year ago. “Richard” he asked me, “Do you remember the chat we had in your dressing room at the Salle Pleyel, in 1992?” In fact, I remembered him from the period I was giving a series of concerts in Paris, but I had forgotten what we talked about. “I have told you that one day I would want you to record an album for Turkey… It is time now!” he added. “To celebrate the 75th anniversary of my country and my 40th anniversary in the music business, I want you to record an album of Turkish music”. So I listened to thousands of CDs and cassettes to select the most appropriate songs both for my heart and for my piano. For us, the French, Turkey is like a bridge between two worlds. Thinking of Istanbul still reminds us of Constantinople and Byzantine. We remember the Ottoman Empire whose boundaries used to extend from North Africa through Egypt and Arabia to the far northern corners of the Black Sea. The history of the Empire has considerably influenced the universe of music, dance traditions and use of musical instruments. It has not been easy to select 12 titles from the mass of works. My choices may please some and displease others but will be justified for it is done with special care and passion. I am grateful to Erkan Özerman for opening the doors of the unknown musical universe of his country, Turkey, to me.